No symptoms doesn’t mean no STI... in 80% of cases there are NO symptoms. Even if you’re positive, chlamydia & gonorrhoea are easily treated with antibiotics. Early diagnosis & treatment lowers the risk of developing painful complications including infertility. 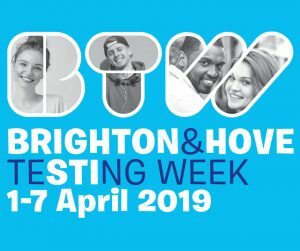 Brighton & Hove has one of the highest rates of STI’s in the country – don’t be a statistic. If you’re not already then make sure you follow SHAC on Twitter to stay up to date with clinic opening times plus lots of useful information about sexual health and contraception! The campaign also highlights the ease, speed, and confidentiality with which testing can be achieved. People are able to take their own samples (urine, oral, rectal, vaginal) without the requirement to be seen by a health professional or an examination. Self-sampling kits can also be ordered to be sent out by post. Getting a sexual health check doesn’t have to be scary or embarrassing. Staff are there to help and getting tested is quick and easy!